While serving in The United States Marine Corps from 2003–2009, including deployments to Japan, Norway and Iraq, Carlos D. Aguirre was first exposed to and trained in handling military working dogs. The methods used to train military working canines provided the spark that started it all for Carlos and led him to the well-known Tom Rose School for dog trainers. Carlos attended the rigorous Professional and Master’s programs, and in 2010 was awarded his Master Trainer and Certified Decoy titles. After graduating and becoming gainfully employed in the canine training industry, Carlos continued to hone his skills on many types of dog training methods such as those used for therapy dogs, search and rescue dogs, military/police K9 divisions, canines in AKC competitions, hunting dogs, Schutzhund, Mondioring, French Ring, the Protection Sports Association, and service dogs for individuals with disabilities. At home and on a personal level, Carlos and his female Belgian Malinois, Beulah, have achieved advanced level competition temperament tests, competitive working dog sport titles and is also a service dog at the young age of three! 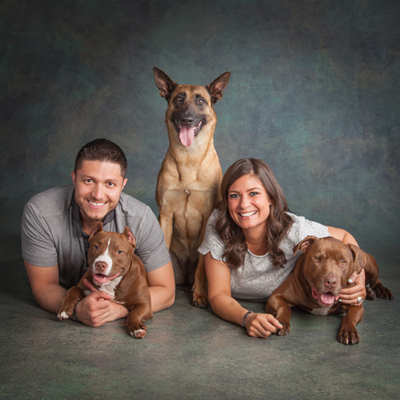 Needless to say, Carlos knew that dog training was his passion and so he founded Wolf’s Lair K9 along with his wife Elizabeth to help owners and canines in Kenilworth, Winnetka, Wilmette and neighborhoods achieve a balanced relationship with one another through knowledge, training and understanding. Elizabeth has been working with dogs from a very young age and has always loved them dearly. Elizabeth’s enthusiasm, understanding, long term involvement and dedication to dog rescue and training has allowed her to engage in her true passion and love for dogs. Realizing long ago that Pit Bulls filled her heart, she has dedicated herself to educating the public about this beautiful and misunderstood breed. Elizabeth was the vice president of Midwest Rescue of Illinois and has routinely worked with Chicagoland Bully Breed Rescue for the past 6 years, fostering, adopting and placing hundreds of dogs. Elizabeth understands the hard work and dedication necessary to create a family bond with this talented and loving breed. Luigi, her main rescue pup has passed many tests including the American Temperament Test, Canine Good Citizens Test and advanced obedience certifying him as a service dog! Elizabeth is currently venturing out into the sport dog world and is planning on competing in various competitions in the near future!